Educators and students gathered at St John’s Cathedral on 19 January to take part in a service celebrating the Provincial Education Day. This year, the service was held in the form of an Anglican evensong. Archbishop Paul Kwong presided over the service in which Bishop Timothy Kwok preached the sermon. Mr Felix Yeung, provincial music director of Hong Kong Sheng Kung Hui, led the HKSKH Collegium Musicum Sacrum in praising God with hymns and psalms while the Diocesan Boys’ School Choir and the School Heads and Teachers Choral Group sang anthems at different parts of the service. 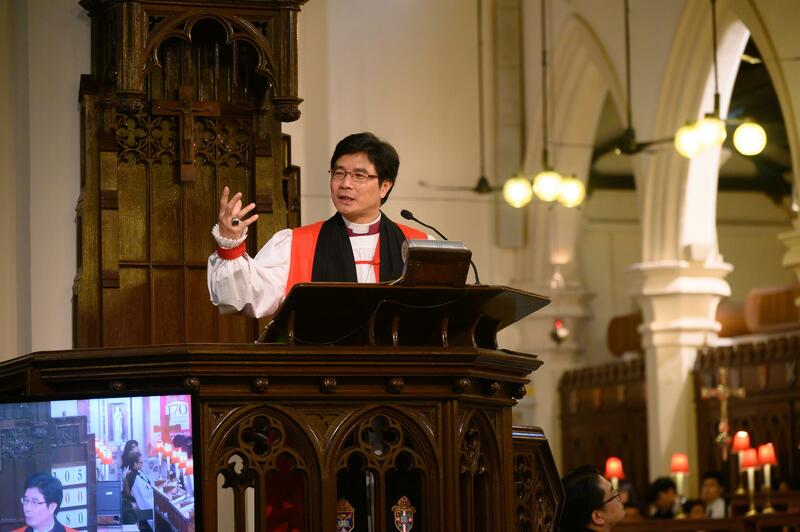 In his sermon, Bishop Kwok addressed the accusations that Hong Kong Sheung Kung Hui or other Christians denominations attempted to “brainwash” students by sponsoring schools. Bishop Kwok used the arguments of evangelical scholars to refute these claims, saying that Christian education was in fact “an antidote to brainwashing”. Bishop Kwok elaborated by saying that Christian faith and education helped people to make the right decisions for themselves. Since all decisions would be made according to the analysis of information available at hand when a choice was presented, by equipping people with different knowledge to exercise sober judgment, the Christian faith allowed students to enjoy the freedom to explore the different choices offered.